You can’t help but feel happy in Panama’s highlands. The views are inspiring, with verdant pines and bougainvillea bursts covering the hillsides. Hidden gems include streams, waterfalls and even hot springs. Not to mention some of Panama’s best flora and fauna…including hundreds of species of colorful birds, orchids, and more. To be sure, Panama is known for its stunning Caribbean islands and popular Pacific beaches. But if your perfect Panama features both lush rainforest and cool climes, head to these mountain towns. In each you’ll find friendly locals and expats, many of whom enjoy better health, a lower cost of living, and a more relaxing pace of life than they did back home. Boquete enjoys what might be the world’s most perfect climate, with morning and evening lows around 65 F and highs barely in the 80s F. The frequent misty rain called bajareque keeps everything green and makes it a cinch to grow just about anything. In fact, Boquete is in Panama’s breadbasket region. Here you’ll find farm-fresh produce, award-winning coffee plantations, and the famous La Amistad bi-national park. There’s plenty to see and do in Boquete and nearby. The neighboring province of Bocas del Toro is famous for its white-sand Caribbean beaches. Just a 35-minute drive from Boquete is the bustling city of David. Every amenity is here, from supermarkets and shops to clinics and an airport. From here you can catch hour-long flights to Panama City (buses take about six hours). In the heart of mostly rural Veraguas province, Santa Fe is a picturesque mountain village. Here a small community of expats enjoys the same simple lifestyle as the locals. It’s the type of place where people still ride bicycles and horses, coffee plants and orange trees dot the slopes, and trails meander through the rainforest. A couple can live comfortably on as little as $1,200 a month here, including rent. Expats who buy their homes are able to live very well on their social security checks—healthcare included. The city of Santiago is just over an hour away by car. It boasts clinics, supermarkets, shops, and many other amenities. With temperatures similar to Boquete’s, Santa Fe lures expats of all ages, many of them in search of country living or even small-scale farming. You won’t find anything much in the way of nightlife here. But the expansive mountain views and clean rushing rivers have an appeal that’s all their own. If you’d like to be near a beach and a cosmopolitan city—and still enjoy cool mountain climes—look no further than El Valle. From the picturesque Boquete to the elegant Sora, Panama offers both diverse and beautiful options for mountain living. Just two hours by car from Panama’s capital, El Valle is tiny…yet it’s one of the world’s largest inhabited craters. A favorite among the Panamanian elite, it is home to expats and well-heeled locals who have weekend and retirement homes here. A small but steady trickle of tourists keeps hotels and eateries in business. The growing hub town of Coronado is just a 30-minute drive from El Valle. In addition to a pristine, uncrowded beach, Coronado boasts shopping plazas, a modern clinic, and one of Panama’s most active expat communities. There’s plenty to do in Coronado, but El Valle isn’t far behind. The lush mountain town is home to one of Panama’s best weekend markets, where you’ll find flowers and plants, fruits and vegetables, and a wide array of handicrafts. If you love the outdoors, El Valle is the ultimate location. Hire a guide and head out on a hike, or visit one of the many attractions, which include a zoo, orchid farm, waterfalls, hot springs, and more. For more upscale fun, Panama City’s performance venues, galleries, museums, gourmet restaurants, malls, cinemas, and more are close at hand. Adjacent to El Valle, Sora is home to a smaller expat community—perhaps 90 households. Most live in the upscale gated Altos del Maria development that dominates Sora. The majority of owners are Panamanians who weekend in Sora. 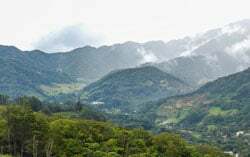 With altitudes from 1,200 feet to 3,400 feet, Sora’s climate is similar to that of El Valle and Boquete. There’s no noise or traffic to mar the quiet and peaceful quality of this mountain hamlet ringed by pines. The town is very small, boasting a police station, a scattering of small shops, and a restaurant or two. With Coronado and El Valle close by, there isn’t need for much else. Once known as a pleasant weekend destination, Cerro Azul is just under an hour’s drive east of Panama City. It’s also close to Panama’s Tocumen International Airport—the region’s busiest hub, with direct flights to destinations all over the world. Cerro Azul is home to a gated development called Altos del Cerro Azul. Though older than Sora’s Altos del Maria, this community boasts some of Panama’s best mountain views. 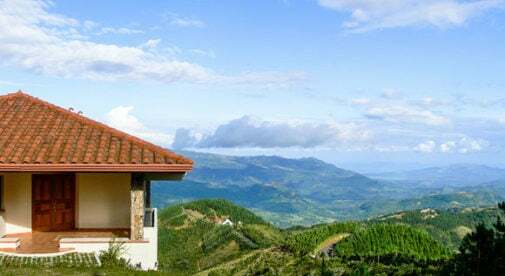 Like many of the other mountain towns mentioned here, you’ll find Cerro Azul dotted with well-built, Swiss-style cottages, colorful flowers, and towering pines. There are a couple general stores and smaller shops here, and not much else. Most expat residents zip into Panama City one or more times a week for all their needs. Cerro Azul is home to one of the oldest cloud forests in the Western Hemisphere. To the north it is flanked by the Chagres National Park, home to one of Panama’s most important drinking water and energy sources. You can camp, raft, fish, bird-watch, hike, and even visit an indigenous Emberá village here. No matter which of these towns you choose, it’s hard to go wrong. Each is relatively close to clinics, shopping and more. And all have solid infrastructure, with high-speed internet, cable, potable water and reliable power. All you need to do is visit and explore!